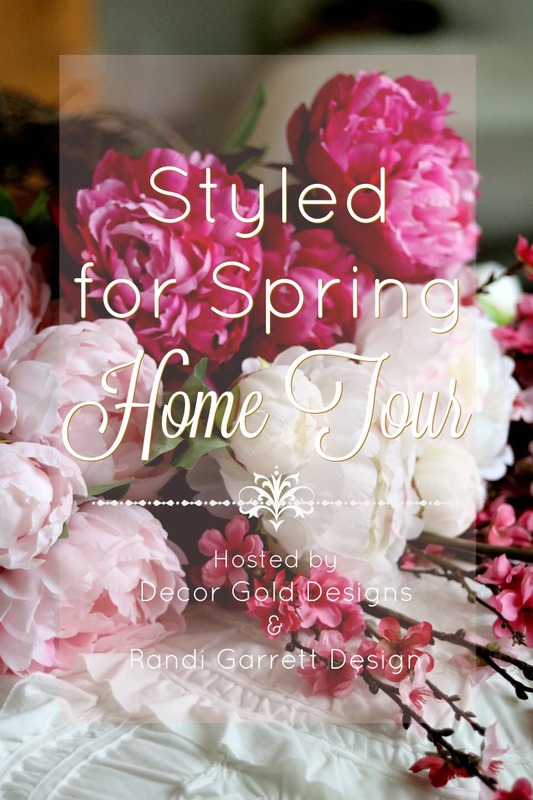 hosted by Randi Garrett Design and Decor Gold Designs! 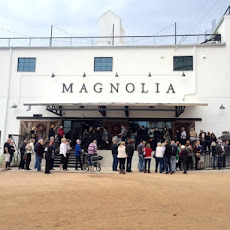 I am honored to be included in their beautiful line up of blogs today. 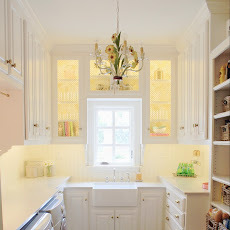 I hope you will visit each one and pin all of these beautiful ideas! The entire tour is at the end of this post. If you are coming from Decor Gold Designs, I am so happy you are here. Isn't her decor just gorgeous?! It's unseasonably warm here in Oklahoma. The daffodils are blooming and the peonies are pushing through the earth ready to burst forth with blossoms. We added another layer of compost to the peonies to keep them extra warm until spring. I certainly don't want to lose them to frost. I was preparing my formal living room for this spring tour, but our family was being drawn outside with the warm weather, so I decided to share our outdoor living room instead. Sit back, relax, and "pin" all the ideas to your favorite outdoor living board! My outdoor living room has gone through a series of styles over the past three years. I think I have finally settled on the blue and white neutral decor to compliment our indoor decor. You can see our previous decor here and here. Come back and tell me which is your favorite in the comments! Ten years ago, we planted tons of daffodils in the woods behind our house. These are the ones I cut to bring indoors. These bud vases are perfect for holding multiple stems. I use them all the time! 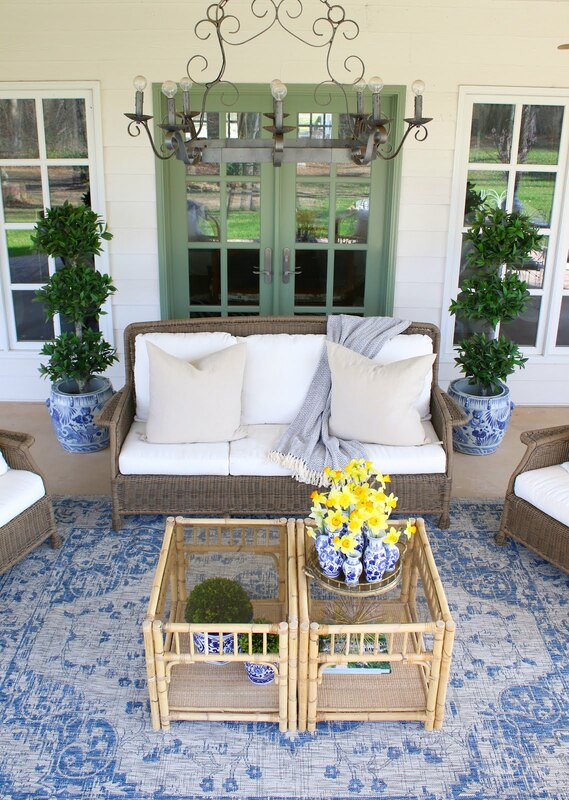 All-weather wicker sofa and wingback chairs are comfy and durable. I have had these for four years without any problems. I wash the cushion covers once a year with a little bit of bleach. A new blue and white rug is the perfect amount of color and pattern for the space. I am loving this calm view. Garden Stools and a similar bamboo coffee table are perfect for setting your book or drink on. The boys enjoy eating their breakfast at my childhood "vintage" wrought iron table and chairs. There is just something so peaceful about water. Thank GOODNESS for faux topiaries! It gets super hot here in Oklahoma. I don't have to worry about these little beauties drying up from the heat! Placed in blue and white planters makes them so stylish. The Buff Orpington Chickens are my sweet little friends. 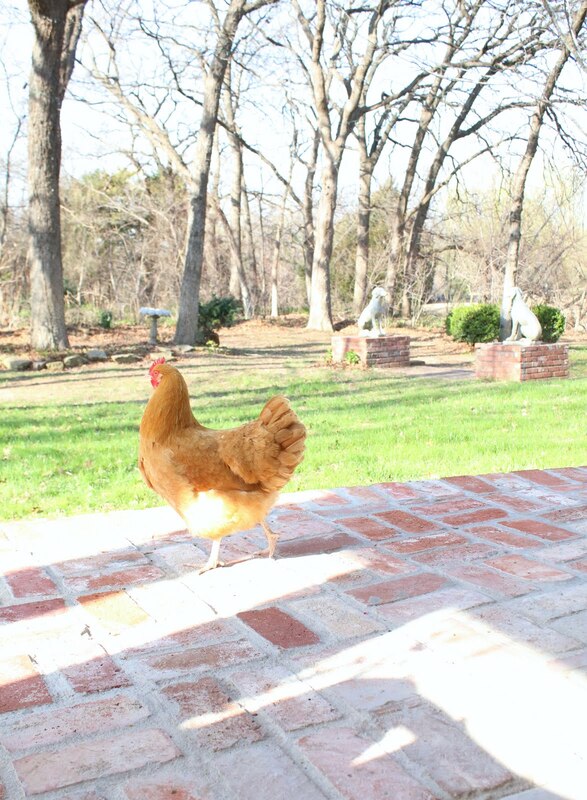 They come when I call and follow me around. To see their antics (and hilarious running) follow me on Instagram and watch my Instastories! 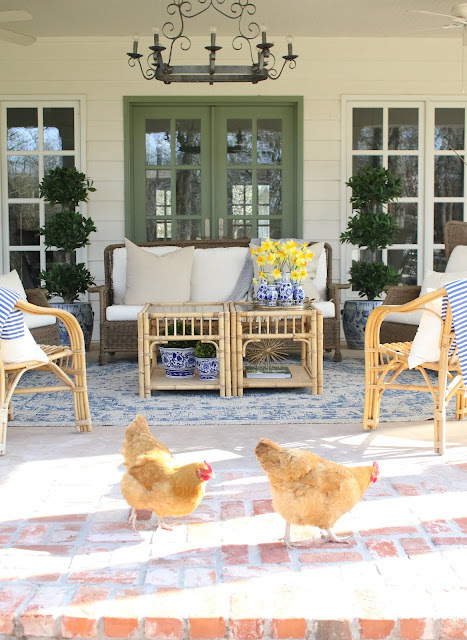 One of the most asked questions I receive is, "How do you keep your porch so clean?" Well, I'll tell you!! Behind the sofa, I keep THIS battery operated blower. I spend about 2 minutes just blowing everything off almost every day. 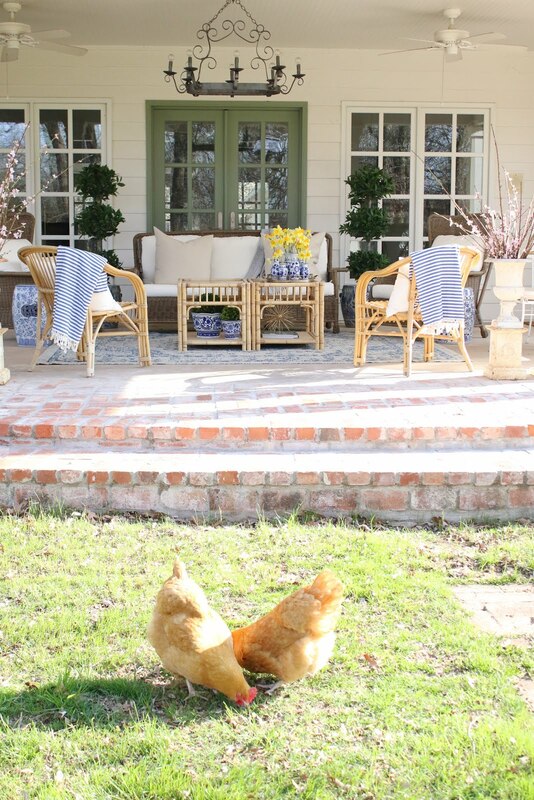 It keeps the porch tidy and makes gathering with my family, friends, and neighbors so much easier. I love to have it "at the ready!" I am so happy you have joined us on this fun tour! 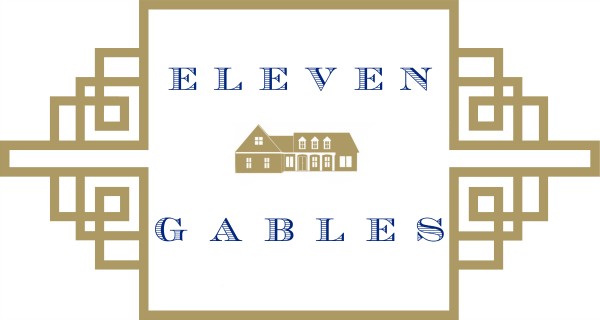 For more shopping the blog, see the "Shop Eleven Gables" in the sidebar. Green door paint is "Hampton Sage" by Marvin Windows. Chandelier is vintage. Now it's time to hop on over to Randi Garrett Design. Her master bedroom is absolutely gorgeous! Such a beautiful space Emily! So lovely, Emily! I've loved all of your porch looks, but I think this is my favorite! Gorgeous! 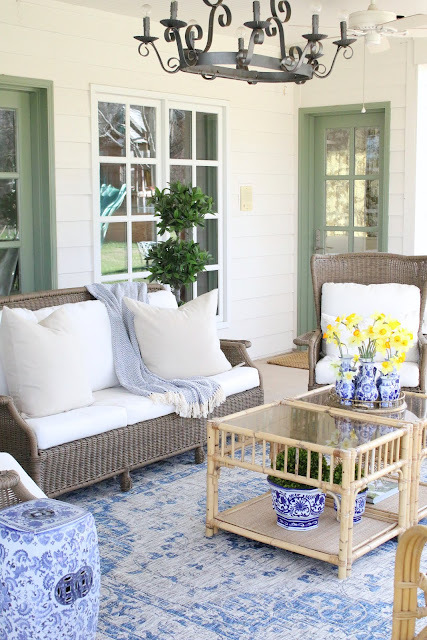 Would you be willing to share what paint brand and paint color you used for the green outdoor windows? I love your style! 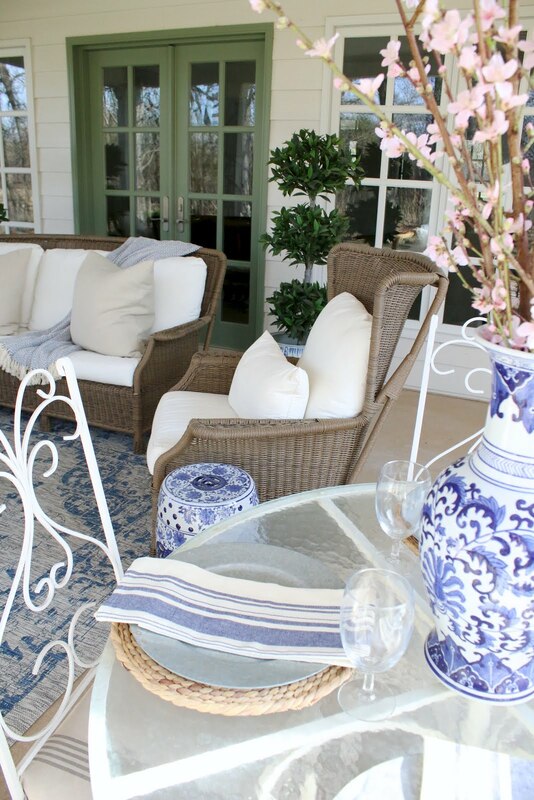 Love your outdoor living room and especially the blue and white favorite Chinese pottery. I have asthma and the smell of cleaning products really bother me. Just discovered mixing Dawn for dishes with peroxide for cleaning. Works well. 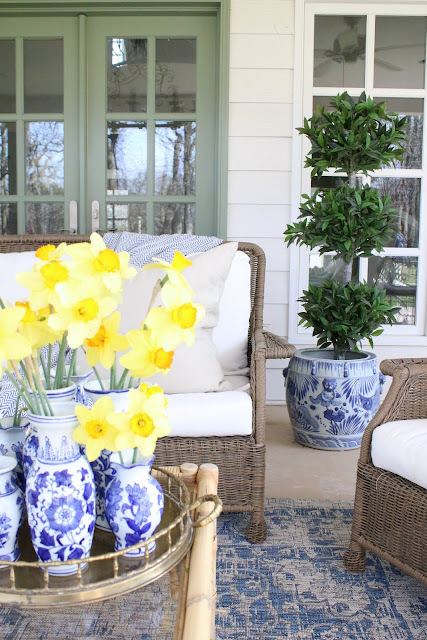 I so love seeing your gorgeous porch in every season!....So, so stunning!...Loving all of the blue and white and bamboo!! 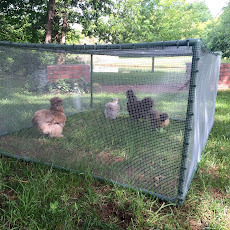 ... and those "chicks" are the cutest! Happy Spring Emily! 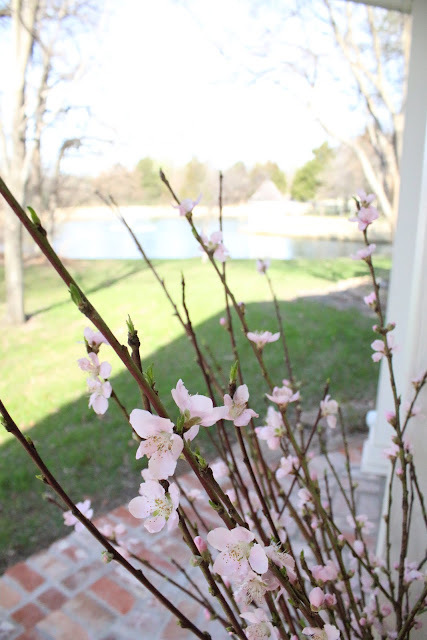 ... it has been unseasonably warm here and now it is freezing...and my flower buds are freezing too! are you serious? which one do we like the best? THIS ONE!!!! IT'S FABULOUS!!!!!!!!!!!!!!!!!!! OMG - YOU HAVE OUTDONE YOURSELF - AGAIN!!!!!!!!!!!!!! 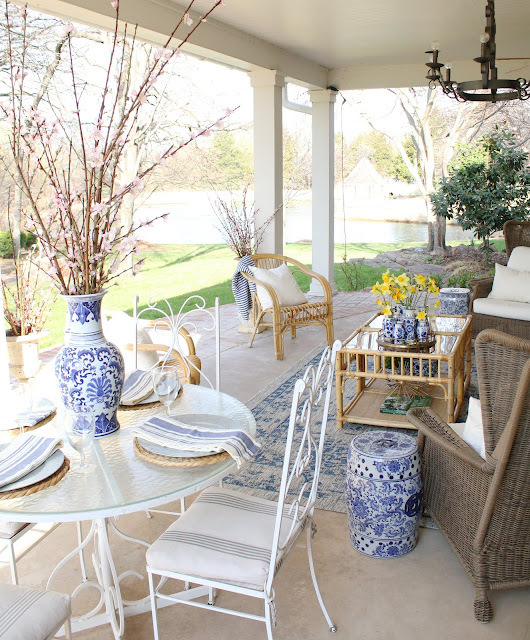 Your outdoor living area is absolutely perfect! 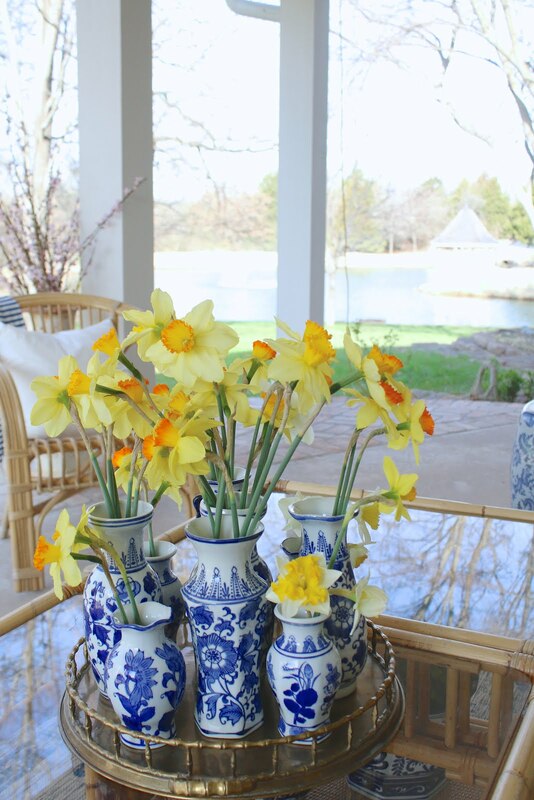 I adore your daffodils.....lucky you to grow them on your property! Thanks for joining us sweet friend! your outdoor living space is just so perfect. I know what room I would be settled in at your house. 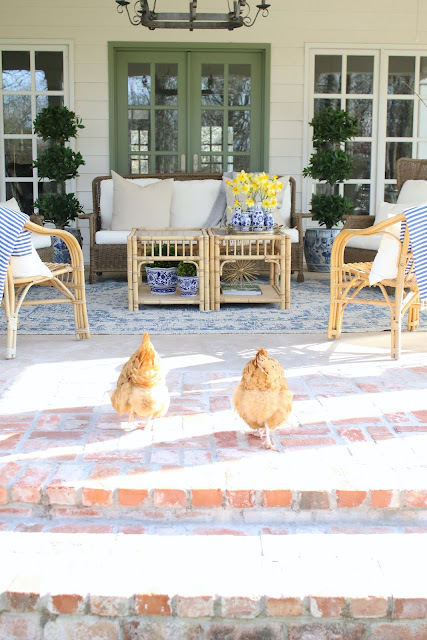 Love your porch Emily! I am still trying to pull ours together. I have the main pieces but some of them need painting and I need to find a new rug. So many things to accomplish in a new house. i love those 2 tables you are using as 1 coffee table!